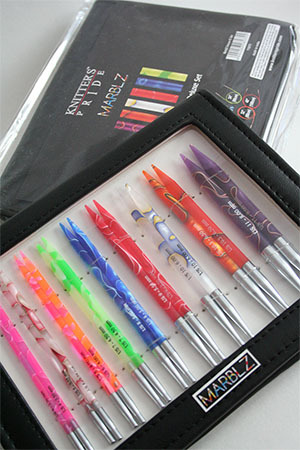 Knitters Pride Marblz Interchangeable Needle Set! 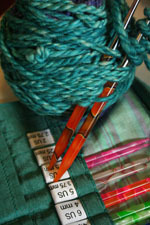 Just in new new Marblz Interchangeable Needles gift set - this set is wonderful to knit with, it's soft acrylic tips are easy on the hands, and the color coded cords make it easy to switch and swap tips and cords. The Set includes 9 tips (4 - 11, includes a 10.5) in a faux leather zip case with cords, connectors, endcaps and cordkeys. Also in the kit - a knitting gauge, cords, cord connectors and endcaps - all tucked in a zippered pocket in the case. Want to dress up your Marblzs? 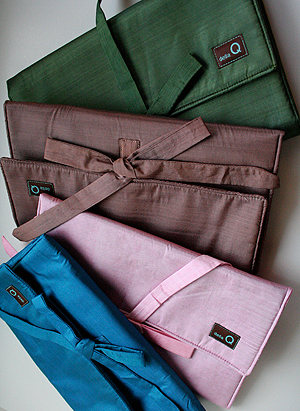 Try a Della Q or Offhand Design SWITCH cases!